Sounds and musics are greatly help in open up a baby's mind, sensory and speech. We don't really need to send baby or toddler to music class at a very tender age. We can always do it at home at anytime. 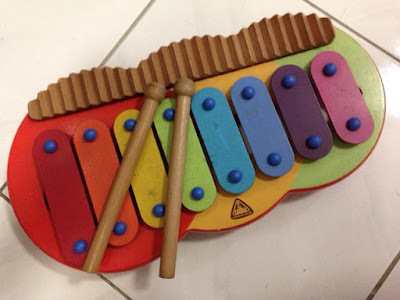 I remembered the first xylophone for my boy was one of his 1st birthday gift from his aunt back then. He started to learn his Do Re Mi using this xylophone. We have lots of fun knocking it and play songs. I still keep this well after many years. Next instruments he discovered was guitar. I need not to go anywhere to get one since Woodwind&Brasswind offers wide selections of musical instruments. Go shop now for any music instruments you can name of, they have it. Looks like xylophone is quite a good gift idea for baby and toddler. I will get one soon for my newborn niece.